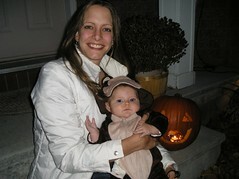 Here's a photo of Avery enjoying her first Halloween with Mom. Avery is still a little too young for trick or treating but she still had fun dressing up and walking around the neigbourhood to look at all the spooky houses. Posted by Anthony at 10/31/2007 11:26:00 p.m.